Holiday Greetings from Karelia Software! We’d love to hear what website-building topics (technical or non-technical) you would like to be covered in the newsletter. Just hit “reply” and let us know! Which is more important to the success of your website: traffic or conversions? The answer is...yes! They are equally valuable and you must address both issues if you have any expectation that your website will produce quantifiable results. Obviously you must be able to generate traffic to your site before a conversion can occur. This is achieved primarily by increasing the number and quality of inbound links to your site. How many links do you need? Hopefully more than the site that occupies the number one position on Google’s first page for your search term. If you are number one on Google’s list, you should keep your link-building process moving so you can stay there. You can’t have too many and you never stop increasing that number. Traffic is also generated to a lesser extent with on-page optimization techniques — keywords properly positioned within tags and content, quality copywriting, internal links, site maps, good html and structure, etc. Sandvox helps you with a lot of this, and we’ve talked about this in previous newsletters. However, 5000 unique visitors a day aren’t very useful to you if they all hit the back button as soon as they arrive. Your site must be able to convert visitors into contacts, leads, or buyers. If the site’s organization is poor, if there are grammar and punctuation errors throughout, or if the content isn’t interesting, it doesn’t matter how much you put into optimization techniques. Do you make a good offer? Do you have an effective call-to-action? Imagine you have landed on your site for the first time after loading a search phrase into a search engine. If you are average, you will take 8 seconds to decide whether to further involve yourself in the site or hit the back button and head somewhere else. Is the initial impact positive? Is there an incentive to stay? Does the content compel you to move towards making a purchase or requesting more information? One way to learn more about these techniques is to visit the websites of your successful competitors or other organizations similar to yours. They did not achieve their success without employing these methods effectively. Don’t copy them, but spend some time trying to determine how they utilized marketing concepts to achieve their lofty rankings. Search Engine Optimization (SEO) is a coin; there are two sides. The Internet has become more competitive each year and that will continue to increase. You must be diligent with respect to both traffic and conversions in order to compete today. Happy optimizing in 2011! Lincoln McCardle used the Jumsoft “Business” design for his website Twittens, one of several sites he has created with the help of Sandvox Pro. With a very relaxed demeanor, this site doesn’t overwhelm the visitor with anything superfluous. The home page very effectively displays his logo and one product photo. The site is clean, simple and easily navigated. 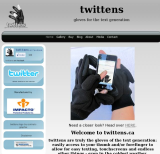 You immediately understand the focus of the site — It's clear at a glance that these are gloves made for cold-weather iPhone owners! The onsite blog actually provides useful information instead of simply existing for SEO value. Go to the “About” page for an interesting story or two. Mr. McCradle is expecting to add an online store to the site by January. With online retail sales expected to increase at a 10% annual compound rate (four times the rate of all retail sales) through 2014, he has wisely decided that eCommerce is an excellent way to market his product. Janet Lamb has gone in an entirely different direction. 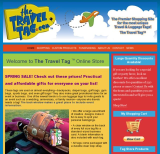 Her site, The Travel Tag is very attention-getting, without any pretense or over-the-top antics. With Sandvox Pro, Ms. Lamb chose the “Simply Colorful” design to show off her unusual travel and luggage tags. The site excels at displaying a fun, memorable logo. As this months' feature article mentions, research indicates that most website conversions take place around eight seconds of the first view of the landing page. There is no question that Janet has used this design perfectly to capture the visitor’s attention in that short span. If you are tired of trying to figure out which suitcase is yours on the airport luggage carousel, The Travel Tag has the solution.